No more time-consuming, error-prone number-crunching. Automatically import your measurables. During the Level 10 Meeting™, the Scorecard is automatically displayed at the right time with the right data. 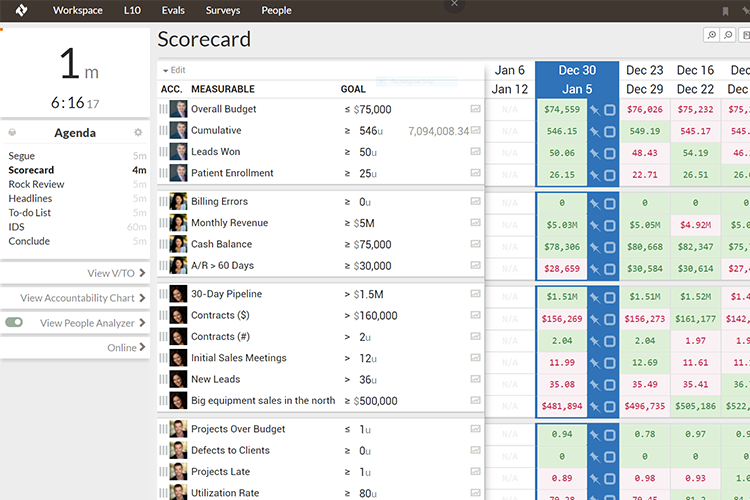 The Scorecard’s visual display gives immediate insight into your metrics. View trends, spot on-track and off-track numbers, and review historical data. Easily share your data with multiple Level 10 Meetings, or move measurables from one departmental meeting to another one. Manual data entry is time-consuming and error-prone. With Traction® Tools software for EOS®, your leadership team can avoid all that. Custom integrations let you automatically import EOS Scorecard data from other applications. During the Level 10 Meeting, the Scorecard is automatically displayed at the proper spot in the agenda, with real-time numbers. Spreadsheets are hard to read and interpret. Key company numbers can get buried in the visual noise, and trends are hard to spot. Traction Tools gives you immediate insight into your metrics. Are there other departments that track the same numbers? No need to enter the same numbers multiple times! You can share your data with multiple Level 10 Meetings, or move measurables from your leadership team meeting to another one (you must have the right level of access to view measurables). Keep a pulse on your company numbers on the go. Scorecard management is integrated into our mobile app, so you can update and view the Scorecard anytime, anywhere.